Spores are the “seeds” of mushrooms. They are microscopic and are mainly produced at the under part of the cap. They are released at maturity. To collect the spores the fully developed caps are placed on a carrier material. 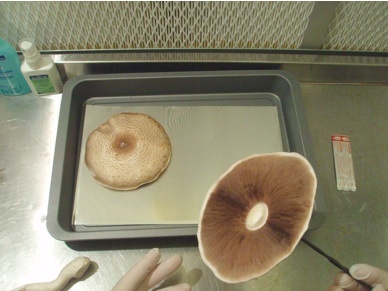 The obtained spore print can be used to start a new mushroom culture. Placing spores on convenient substrate (most common are malt-agar substrates in petri dishes) induces mycelium growth. Proceed cautiously as sterile and clean as possible. The spores should not get in contact with contaminations while taking the print. Put on face mask, hairnet and gloves; clean the working area in front of the HEPA-filter or the Glove Box inside and disinfect the container and the aluminum foil (the needed tools are already inside the Glove Box). Finally disinfect your gloves and allow drying off. Cut off the designated mushroom cap carefully at the upper end of its stem; try not to damage the gills or pores. The disinfected aluminum foil collects the spores dropping out; transfer the cap with its lower surface briskly on to the foil. 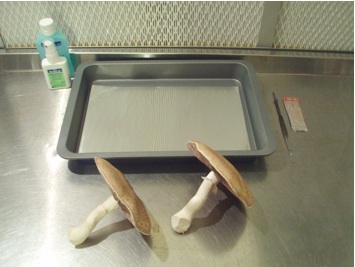 Cover them up in the disinfected container, for best result the caps should not dry out and stay clean while donating spores. After 12 to 24 hours the spores should have been released, favorably they adhere to the foil by themselves (wear protective clothing, clean and disinfect working area and tools!). Remove the cap by impaling the upper surface on a scalpel. Do not touch the foil or spore print to avoid contamination. Be sure the residual moisture is allowed to evaporate before packing the print. Sealed in an airtight zip-lock bag, spores stay viable for about one year. 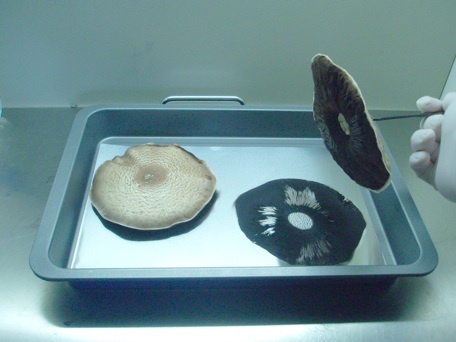 Store your spore prints at room temperature in a dark and clean place.